It's not the pies that makes other people hate the Yankees, but the fact that those outside of the Yankees have to glorify it. Topps announced 12 variations in 2010 Topps Series 1 that feature Yankees getting pied after their walk-off wins. As a Yankee fans, I enjoyed every single one of them. I attended four or five of them, which was a 90 percent rate considering the amount of games I got to see at Yankee Stadium last year. However, why does anyone is not a Yankee fan care about these variations? Furthermore, why does a set like this need to glorify it this way? 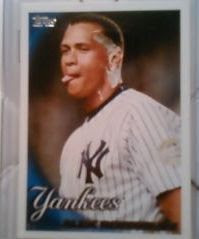 I'm not saying I wouldn't lick the pie off ARod's face - actually I am going to say that, I would - but when else has Topps or Upper Deck commemorated a team winning over so many different cards. Every year there is card highlighting the World Series champions, which I think is a great idea. You don't know when your team is going to win again and it's a nice piece to add to your collection when it's your team. But 12 cards featuring guys creaming each other? Perhaps this should go in another set that is not sold to children. Here's some more information regarding these cards (link) and another mystery that has yet to be revealed (link ... look toward the bottom for the mystery) regarding 2010 Topps Series 1. Where's Stale Gum when you need him? Topps knows that there are a lot of Yankees fans out there, they probably would have pulled the same gimmick if the Red Sox had won. confirmation word: berlzao - (n) Steve Wynn's newest casino. Thats a reason to hate a card company not the Yankees though. Same with Yankee Stadium Legacy. neither gimmick/subset bothers me. I'm with Justin G - if you get a pie card its more tradeable then say an Eric Bruntlett card for the non-phils fan. of course if it is your one per box hit - I suppose I could see the anger. I'm sorry. I should have said the reason people hate the Yankees is because of the East Coast bias shown toward the Yankees. They get much more attention than other teams and over-information regarding the Yankees annoys a lot of other fans. I'm just glad these aren't in the base set. Then, I really might be annoyed. "But 12 cards featuring guys creaming each other? Perhaps this should go in another set that is not sold to children." Best line in a blog ever. But the line about licking the cream off A-Rod's face kind of makes me feel kind of icky. I am a Red Sox fan, but the baseball fan in me appreciates the Yankee Stadium legacy cards. As much as I hate them, they reside in the largest city in the country, so the attention paid to them is probably just. Plus they are pretty good usually. No one except the fans of that team give a crap about losing teams. You know that, covering sports. I figured it is because Topps is based in New York. And they're following ESPN's lead in catering to the largest (allegedly...) fan bases of New York (and secondarily Boston). Though in this case, I don't mind because pies-in-the-face are fun and don't over-glorify the Yankees. It's actually a great idea for a variation. Just too bad they're probably impossibly short printed.